‘There’s a storm coming, Harry…and we all best be ready when she does.’ (Hagrid, Order of the Pheonix). A storm-in-a-teacup really; one that gets whipped up this time each year, as teachers in the UK join their International colleagues (many of whom are starved of half-terms!) for the start of the Summer holidays. Cue the friendly banter as you struggle to avoid: The Great Summer Holiday Debate! You’ll bite your lip or try – in vain – to justify the length of time. You’ll look for back-up; it might be forthcoming but many will crumble and retreat to the bar or kitchen. I take my hat off to those working 7-day-weeks with little or no holidays – I couldn’t do it myself. I need to recharge my aging batteries; my pupils certainly need to recharge theirs! Six weeks seemed so long when we were kids. A lifetime. I’m not saying it’s not long enough – far from it. This year though, let’s turn the debate on its head; lets take a look around Europe to see who’s already enjoying the the beach, spending time with family and keeping a close eye on the new school year. I get the debate – I really do! But wherever children have been taught this year, there’s a teacher in need of a rest and a cuddle. Go easy on them; surprise them; calm the storm and they’ll love you for it! (Since writing this, I’ve seen a Spanish teacher say that their kids have longer than 8 weeks, so let’s use this as a guide shall we? They’ll be discrepancies I’m sure – please don’t hold it against me! 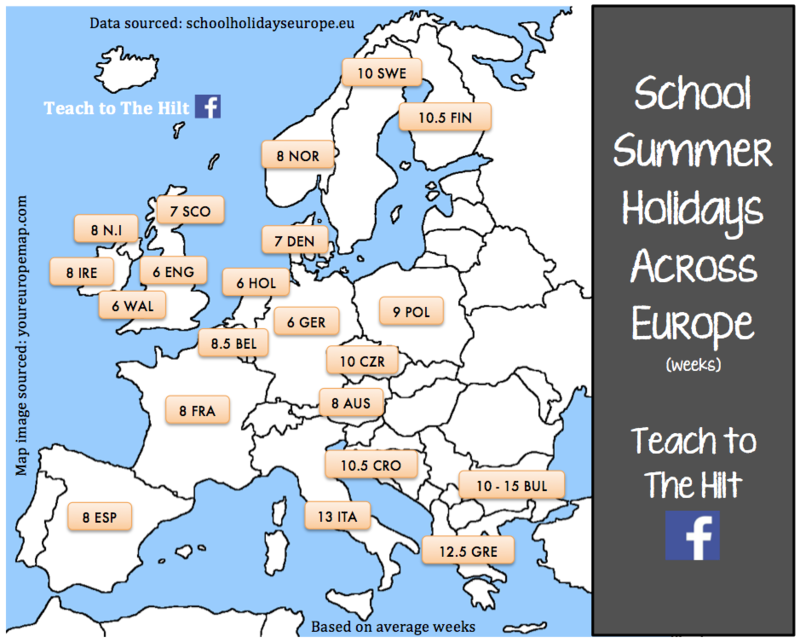 All holidays are worked out from data at schoolholidayseurope.eu – correct at time of post; map image from youreuropemap.com; holidays based on average number of weeks *Bulgaria based on difference between nursery & secondary).